Warm weather and fun trips to the beach, dog parks, and hikes can mean more fun and exercise. 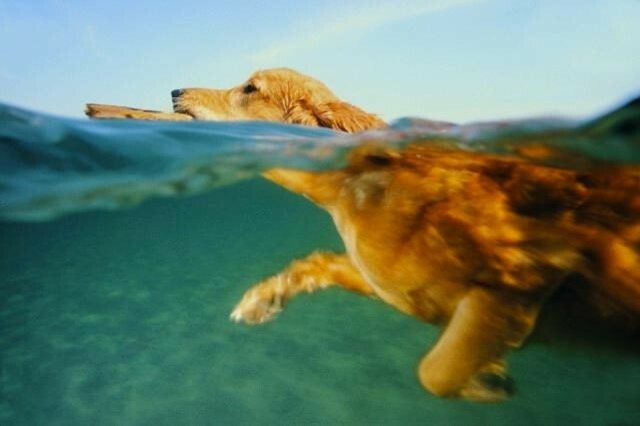 Your dog might also want to swim. Before diving into the lakes, pools, and sea make sure your dog is prepared for it. Swimming pools can be dangerous for dogs because they may not be able to climb out due to the design of the steps or ladder. Lakes and beaches have debris that can get tangled around your dog’s legs and tails. Cats aren’t big swimmers but they can swim. I’ve never met a cat that likes to swim but I’ve met several cats that don’t mind walking through shallow water and like to play with the light reflections that dance on the water. Secure your pool with a gate to keep your dog out when he’s in the yard. Never leave your dog unsupervised or unattended when around the pool. Make sure your pet can get out of the pool. If your pet jumps in and doesn’t have a way to get out it can cause a panic reaction. Ramps can be added to your pool to help your pet walk out of the pool if you have a ladder. If your pool has steps, make sure your dog knows where they are by walking her down and up them every time she wants to go into the water and out. If your pet is unsure of the water, introduce her gradually. Anxiety about diving into the water can cause pets to panic and sometimes drown. When on a boat, put a pet life-jacket on your dog or cat. If your pet seems to suffer from sea sickness after your first ride out, maybe it would be best to leave her home. Don’t let your pet explore lakes or streams without you. They may drink the water or eat something that is bad for them like another animal or algae. Your pet could develop an upset stomach. Don’t let your pet drink the pool water. The chemicals used to keep it clean can cause stomach upset and dry mouth. It’s inevitable your pet will swallow some water but try to prevent them from drinking it. Nice Tips, I don’t have a ladder in my pool, with you information am going to re-construct my pool with ladder. I know it will be helpful to humans as well as pets.